There were many people who wandered in and out of the Inklings conversation, including Dorothy L. Sayers (who one writer called a “para-Inkling,”) but the the core group was Tolkien, Lewis, Williams, and Owen Barfield. Barfield was an attorney and also an adherent of the anthroposophical ideas of Rudolf Steiner (the Waldorf Schools arose from his thought about creativity). Steiner’s philosophy and his emphasis on creative imagination was attractive to them all. Barfield was its biggest proponent, and was a member of The Anthroposophical Society. In a review of a 1996 documentary about Barfield (Owen Barfield: Man and Meaning), reviewer Dale Nelson writes: Many people who look into the writings of Owen Barfield, … are C. S. Lewis admirers who are curious about this man who was Lewis’s close friend throughout his adult life, from 1919 until Lewis’s death in 1963. Barfield was Lewis’s legal and financial advisor, and he became an executor of his estate. Lewis dedicated his first scholarly book, The Allegory of Love (1936) to this “wisest and best of my unofficial teachers,” stating in its preface that he asked no more than to disseminate Barfield’s literary theory and practice. He also dedicated the first Narnian chronicle to his friend’s adopted daughter Lucy. In his autobiography, Surprised by Joy, Lewis portrayed Arthur Greeves as the First Friend, who reveals that one is not alone in the world in one’s imaginative outlook, and Barfield as the Second Friend, the one who never fails to challenge and to prod one to new understanding. 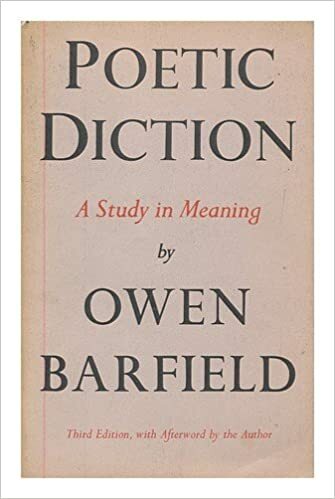 Barfield wrote several very interesting books, including Poetic Diction, which includes the key thinking that so interested Lewis and the others. Nelson writes: Barfield’s thought is always characterized by the conviction that the humanities matter very much indeed, for all of us—not only for professional academics. Poetic Diction, along with Lewis’s Experiment in Criticism and Tolkien’s “On Fairy-Stories,” will reward anyone needing assurance of the value of literary experience. Poetry, Barfield shows, can provide a “felt change of consciousness”—experiencing a single line of poetry, one may from that moment know more, though what is known is not a matter of “fact.” Poetic Diction (1928), dedicated to Lewis, is Barfield’s most extended treatment of this insight. Reading Barfield isn’t exactly an easy undertaking, but it is worth the effort, especially if you’re interested in delving more deeply into the back stories and thinking of Lewis and Tolkien. Dale Nelson review: http://www.touchstonemag.com/archives /article.php?id=11-03-036-b (accessed September 14, 2017). Owen Barfield’s Poetic Diction was a cornerstone of my humanities education at Valparaiso University. I wonder what’s become of my copy. In Portland, I imagine.